Bananas. 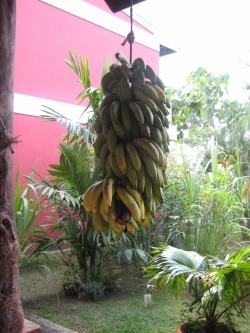 There is a good reason Costa Rica is one of the largest producers and exporters of bananas. They are perfectly ripe and tasty. Almost any view of the landscape will include banana trees with heavy clusters of the yellow fruit. Watermelon. Called sandía in Spanish, watermelon found in Costa Rica is remarkably fresh and sweet. Roast pork or chicken. Sometimes the locals will cook the meat over coffee wood so (in my opinion), the flavor can excuse the extreme chewiness of most of the meats. Cappuccino. 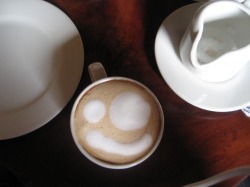 Costa Rican coffee is strong—but try this one anyway in honor of the cappuccino-faced monkey. If you drink the whole thing, you’ll probably have enough energy to go climb the trees with them. The countryside at a slow pace—preferably on a horse so you won’t miss a single flower or local farmer. Santa Elena Cloud Forest. The fact that this reserve hides in the clouds is enough of a reason to go! Make your way through the chilly mist and keep an eye out for all types of birds, plants, and animals. Plant a tree. Costa Rica sets the precedent for other countries to follow in terms of conservation. So why not make a difference and plant a tree near a local school? Go zip lining. Even if you are afraid of heights, you must give zip-lining a try. Coasting on cables a mile high with nothing but a harness connecting you is absolutely thrilling. Pay attention in the lesson beforehand for some important safety tips. Go on a night tour of the jungle. Small towns in Costa Rica aren’t necessarily known for their nightlife; so take your senses (minus your sight) on a trip through the dark rainforest. Trust me—you’ll never take the light for granted again.